I climbed a route earlier this week, a 5.10c, that had been set by a tall guy with long arms. The route only utilized pocket holds and actually ended up being a lot of fun, albeit challenging, and I was able to flash it first try. But I didn’t use the beta, or sequence of movements, that the setter had intended for this route. Why? There were a few instances where I had to bump my hand up to a foot chip in order to get to the next hold above me because there was absolutely no way my arms were going to reach the designated hold without grabbing onto something else in between or trying to lunge up to that hold by flailing my body toward it. After climbing it, I wondered, if a woman had set that route would she have intentionally set the route by placing handholds where those foot chips are? Or tweaking this and that so a fellow woman felt like she could still climb it without sacrificing technique or beta? I imagine she would because she understands the body movement of a female climber. She gets that being 5’4 with short legs requires some creativity when it comes to big, reachy routes and therefore, sets with that in mind. She knows our upper body strength might not be as powerful as a man’s and that knowledge is evident in the routes she sets. Women are climbing now more than they ever have and that’s really exciting. With athletes like Margo Hayes, who recently became the first woman to climb 5.15a, pushing past the limits of the sport, I believe many women are gaining more confidence to get out and participate alongside men. 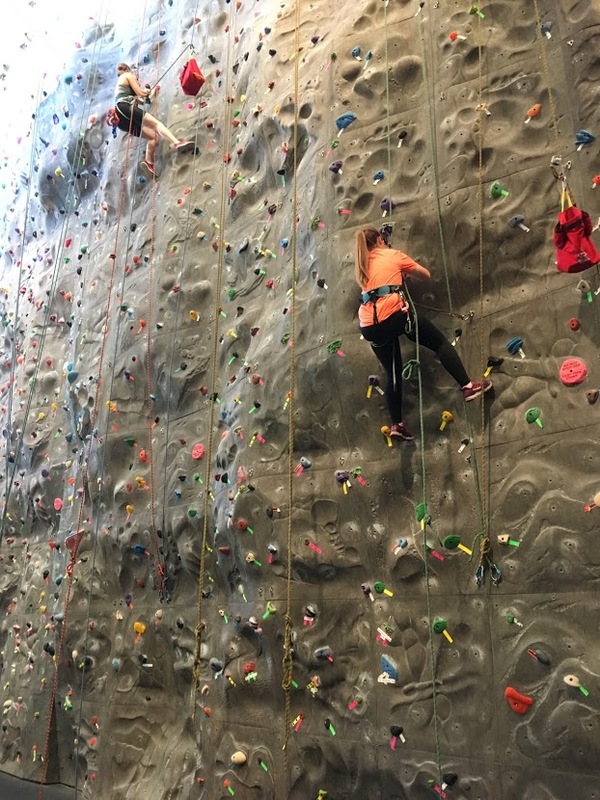 On the recreational level, climbing is a sport that is more inclusive of women than any other sport. Think about walking onto a basketball court full of burly men playing a game and wanting to play with them. The chances of them inviting you to join are probably pretty slim. But at a climbing gym or a crag, it doesn’t really matter if you’re a man or a woman. Climbers want to climb, gender aside. I feel like an equal to the men in this sport. And that is cool – both for me personally, and for the sport itself. There are isolated incidences where this isn’t the case or where women don’t feel as confident or equal but I think across the board, women and men are on the same playing field here. It’s a vastly different picture in the setting community, where the ratio between female and male setters is highly imbalanced. Men set more than women. So what does that mean for the sport? It means that there is a lack of accessible, diverse problems and routes for climbers of all levels and body types – a frustrating issue to tackle if you are a woman. So, we are climbing just as much as men but why aren’t we route setting just as much as men are? I was reading an article in the Mountain Project Journal about this issue, titled “Where Are All the Female Route Setters,” and the author, Julie Ellison, said: “when seeing that most route setters are men, it can be easy for women to assume that the setting world isn’t a place for them.” To piggyback on that, she quoted Lance Hadfield, head setter and operations manager of Stone Age Climbing Gym in Albuquerque, New Mexico when he stated that “there’s a lot of opportunity out there for female route setters, but women applicants are outnumbered 10 to 1.” It seems that intimidation is the biggest factor in producing a lack of women setting in the gym. It makes sense. Route setting and forerunning for hours a day is physically demanding work. In addition to that, there are insecurities for women that come with climbing or setting next to a man: what if he thinks I’m too weak? What if he thinks this route isn’t good enough because it was set by a woman? And so on and so forth. I think these insecurities stem from the fact that, up until recently, climbing has been male-dominated and it is easy for women – and men too – to act as though women are somehow lesser because of it. I do not believe men are responsible for the reservations women have in the setting community, but is saying they aren’t responsible letting them off the hook? Could men be doing more to make us feel more comfortable? Personally, I don’t think it is another person’s job to make sure that someone alongside him is or isn’t secure. Route setting is highly subjective: some people are going to love your route, some people are going to hate it. Most of the time, the person who dislikes it doesn’t feel that way because it was set by a woman; they’ll dislike it because of other factors, like a difference in climbing styles, balancy moves vs. dynamic moves, etc. While being a woman in the setting world brings forth numerous insecurities, I do not believe it’s something we should use as a crutch. And it’s definitely not something that we should let define our abilities as climbers or route setters. The only way to get over an insecurity is to stop letting said insecurity have any power over you. Most insecurities are irrational, anyway. In an interview with Outside magazine, Alex Puccio, commenting on whether or not women will be able to climb grades that men can, said, “women can get to that level too. It’s just that there aren’t that many trying. At least not yet.” Sure, she was talking about climbing here but I think what she said applies to route setting too. Perhaps the biggest reason as to why there are far fewer women setters than men is because we aren’t trying to be route setters. We are too intimidated or nervous and thus wave away the opportunity that is presented to us. Lynn Hill was the first person, male or female, to free climb The Nose on El Capitan. It was a big moment for all climbers. Imagine if she had shied away from doing it because she was too nervous or insecure about that fact she was a woman. I have hope that as more women become involved in climbing, the number of women who route set will also go up. Women in climbing are pushing barriers we never thought possible and I think when we realize that the gender gap in route setting stems from a lack of effort on our end, paired with a lack of confidence, we will see a shift in how many women set. We can climb what men are climbing; why not let the men climb what we are climbing? How Do You Witness a Place?